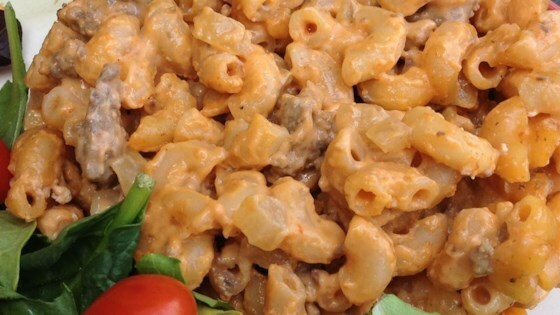 "Homemade version of Hamburger Helper® - just as easy and tastes so much better! You will need a large skillet with a tight fitting lid." Heat a large skillet over medium-high heat. Cook and stir ground beef, onion, garlic powder, onion powder, salt, and black pepper in the hot skillet until browned and crumbly, 5 to 7 minutes; drain and discard grease. Return skillet to burner over high heat. Add water; cover skillet and bring to a boil. Stir macaroni into the boiling water-ground beef mixture; cover and lower heat to medium. Cook, keeping covered, for 5 minutes. Stir, cover, and cook until macaroni is tender, about 5 more minutes. Stir processed cheese food into ground beef-macaroni mixture until melted. Remove from heat; stir in sour cream. This is homemade mac 'n cheese just like grandma used to make. For a Mexican version, add 1 tablespoon cumin and 2 teaspoons chili powder to the hamburger as its cooking. Serve with chopped lettuce, tomato, and salsa. If you're really in a hurry, can use dehydrated onion instead of fresh. Add more onion powder. This turned out amazing! I followed the recipe exactly & my family devoured it! I will definitely make this again! We loved this. To make it not so dry I added 1/4 cup milk. I also topped it with sliced American cheese and stuck it in a 350 degree oven for 15 minutes to brown. GREAT!